A revised version of The Essential Guide to Motorcycle Travel has been published and it's well worth a look if you're planning a trip. There's tons of pictures and while some of them appear to be kept from the 2007 version you'll still get the idea. A camera mount for example might have a 2007 edition of a camera - tough to keep up with the technology there but the mounts will still work fine with more modern gear. 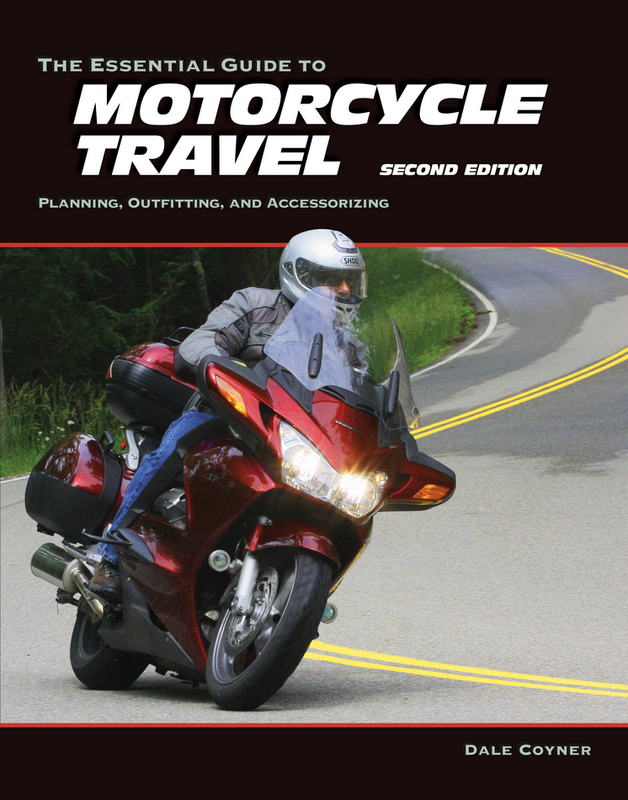 Overall we'd say it's a highly useful book if you're interested in motorcycle travel or if you're already motorcycle traveling and want to learn some new tricks. The updates are mostly related to the latest information on using and integrating mobile and Bluetooth communications, GPS navigation, high-efficiency lighting, action cameras, and high-tech materials and fabrics. Touring on two wheels is one of life’s simple pleasures. And learning how to do it right can help keep it that way. This new 2nd edition of Dale Coyner’s popular Essential Guide to Motorcycle Travel is full of the collected tips, tricks, and advice of seasoned travelers and experts from the motorcycling community that help to maximize the ride, while minimizing lessons learned the hard way. In sharing their broad experiences, along with his own, bestselling author and straight-shooter Dale Coyner offers up the wisdom riders need to plan their own dream trips, accessorize their bikes, outfit themselves and their passengers, and deal with contingencies as they inevitably arise, whether out for a day-trip on home turf, a riding vacation in another part of the country, or preparing to conquer the far asphalt reaches of the globe. Coyner leads both newcomers and veterans step by step in the right direction, outlining a template for estimating mileage and expenses, and offering advice for evaluating the many excellent gear and apparel choices veteran riders use to stay warm, cool, and dry in the face of the elements. Small adjustments to ergonomics can also make big differences in comfort. Numerous and versatile luggage options can be mixed and matched to keep gear secure, and trailers can open up new possibilities for camping or hauling necessities. Since the fun factor decreases when things aren’t fundamentally safe, Coyner also teaches how to manage the variables under every rider’s control, which can include choosing tires and accessory lighting, packing well, performing preventive maintenance, and adding electrical gadgets responsibly. Today’s two-wheeled travelers can easily integrate into their cockpit all the benefits and convenience of smartphones, Bluetooth communication, digital entertainment, GPS navigation, and action cameras, and Coyner shows you how. Knowing what is available and how to install it allows one to make savvy choices that will increase enjoyment on the road. And, after all, isn’t that the whole point? Dale Coyner is an avid, experienced motorcyclist and the owner of Open Road Outfitters, a motorcycle accessory shop in Sterling, Virginia, that specializes in the sale and installation of motorcycle trailers, lighting, and electronics. His first book,Motorcycle Journeys Through the Appalachians, remains a popular guide for motorcyclists planning trips through the mid-Atlantic and his newest touring guide,Motorcycle Journeys Through North America, catalogs and describes the iconic destination highways that have inspired riders over the decades to take to the road. In 2006, Coyner was appointed to the Governor’s Motorcycle Advisory Council for the Commonwealth of Virginia to promote motorcycle tourism, safety, and economic development. He speaks frequently at rallies and motorcycle club meetings on motorcycle travel and related technical topics. Here's a new edition of the always well done Motorcycle Journeys Through series from WhiteHorse Press covering New England. New England is a close ride for a huge population of riders. I've personally been to many of the States covered in this book and must say that there are some fantastic roads and scenery. Center Conway, NH, June 2013—Whitehorse Press has just released an all-new edition of one of its most popular touring guides, Motorcycle Journeys Through New England, just in time for riders to make the most of the riding season. New England has everything a motorcyclist could want: twisty, historic roads; wild and scenic vistas; and interesting, quirky, accessible destinations worthy of stretching your legs. Vermont native and moto-insider Ken Aiken thoroughly covers Vermont, New Hampshire, Maine, Massachusetts, Connecticut, and Rhode Island in 28 routes that catalog the very best they have to offer, from shoreline to summit. The pace of touring on two wheels is especially well suited to appreciating and pondering the forces—both natural and man-made—that continue to shape New England. Many of the most popular riding roads evolved from native and pre-colonial trade routes, which may have begun as game trails. Routes rise, fall, and sweep with contours that follow a rugged terrain initially traversed during a slower time. Few books before this one have offered up as many regional gems to touring riders. In addition, Aiken has tapped into his lifelong interests in history, architecture, geology, and industry to offer up fascinating tidbits of local detail, adding colour and context to the extrasensory movie that will be playing on your visor. 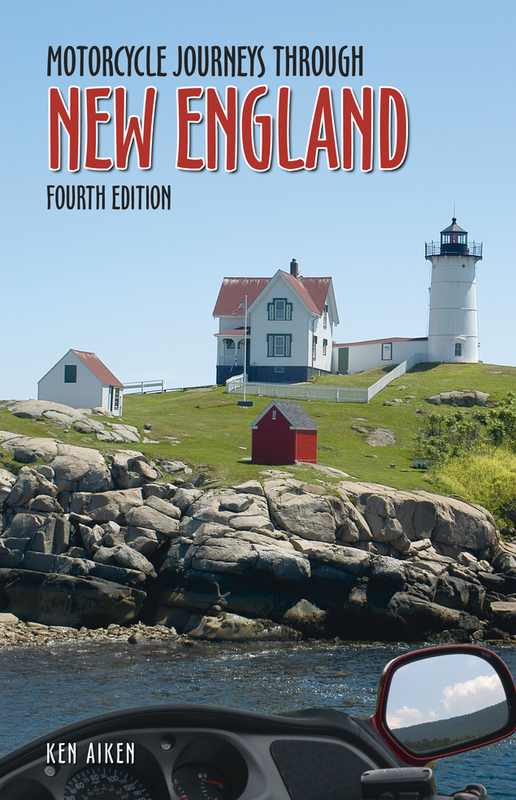 This all-new edition of Motorcycle Journeys Through New England features full-colour maps with turn-by-turn directions for each suggested route, along with updated information for motorcycle-friendly services, memorable lodging and dining, and points of interest that take you off the beaten path. Ken Aiken is the author of Motorcycle Journeys Through Atlantic Canada and Touring Vermont’s Scenic Roads, and has written feature articles and reviews for most of the major motorcycle touring magazines in North America. For more than a decade he has been a seminar speaker at Americade in June, and more recently has been the U.S. representative for motorcycle tourism in Canada for the Charlevoix, Mauricie, Saguenay, and the Maritime regions of Québec. Softbound, 5-1/2 x 8-1/2 inches, 352 pages, colour illustrations and relief maps, detailed route instructions, $27.95. Copies will be available at your local bookstore, motorcycle dealer, or can be ordered in advance directly from the publisher, Whitehorse Press, 107 East Conway Road, Center Conway, NH 03813-4012. Telephone toll free 800-531-1133 or visit their web site at www.whitehorsepress.com. Not only does this newest edition of Motorcycle Journeys Through the Pacific Northwest showcase unforgettable rides in Oregon, Washington, and British Columbia, its author’s enthusiasm for still more motorcycle exploration will also entice visitors to return to this gorgeous region for multiple looks, and reacquaint lifetime locals with the beauty and uniqueness of their home territory. From twisting mountain roads with vast tall forests and stunning views of snow-capped volcanoes, to curving coastal roads winding past pristine sandy beaches and rugged rocky cliffs, the diversity of riding in the Pacific Northwest is breathtaking.You can discover ancient river-cut canyons, high purple desert, crystal-clear lakes, misty romantic islands, and friendly people lost to time and logging or fishing—all on the same day. 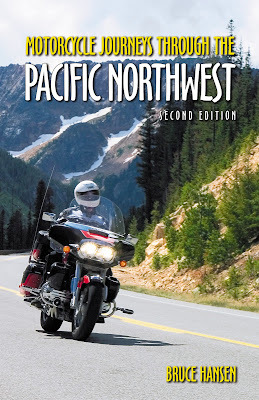 Written by veteran motojournalist Bruce Hansen, Motorcycle Journeys Through the Pacific Northwest details thirty-one trips through this motorcycle paradise with colorful commentary, useful relief maps, dazzling color photographs, and clear route directions. Each trip takes one to two days to complete and is guaranteed to lead riders to new places of interest on lost roads that are a delight to find. 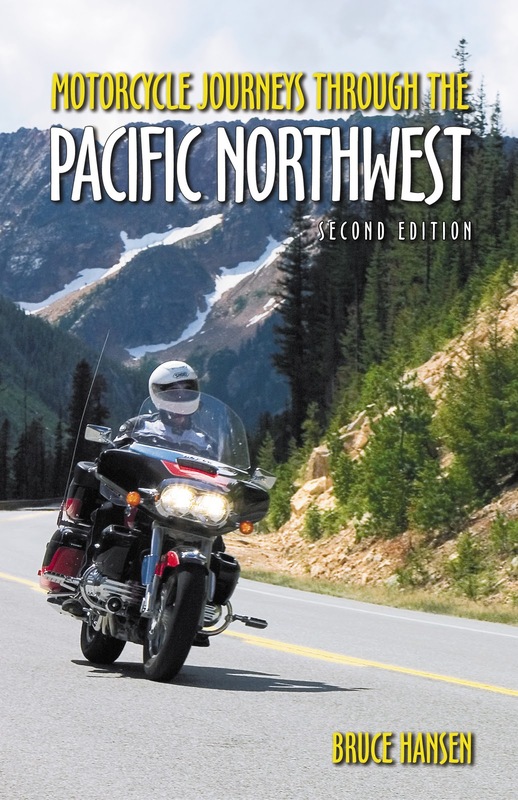 Here are the best-kept secrets and most famous rides of the Pacific Northwest, the very things that make motorcycle travel so special.Those riders familiar with the first edition will want to try the new rides in this edition, including road’s end on Vancouver Island, a Hells Canyon getaway, and an Auderheidi Hot Sprint ride. As a local rider, Hansen recommends restaurants, diners, places to stay (including campgrounds), and interesting things to see and do from an insider’s perspective. His tips will save precious vacation time for visiting motorcyclists and locals alike. Helpful sidebars give you information on where to rent a motorcycle, how to get lower rates on accommodations, up-to-date regulations on crossing the U.S.- Canadian border, and tips for hot weather and desert riding. Trip 31, called Deuce-and-a-Half, shows how to cover the whole Pacific Northwest in 14 days and 2,500 miles. If you have just two weeks available and the determination to see it all, this book will help you make the best use of your time and money. Details: Paperback, 5 ½ x 8 ½ inches, 384 pages, full color illus and maps, list price $29.95 USD. Whitehorse Press has announced the publication of Motorcycle Journeys Through Western Europe, the latest in its popular “Motorcycle Journeys” series. A trip to Europe is high on every touring motorcyclist’s travel list because it offers great roads, beautiful scenery, and centuries of history. 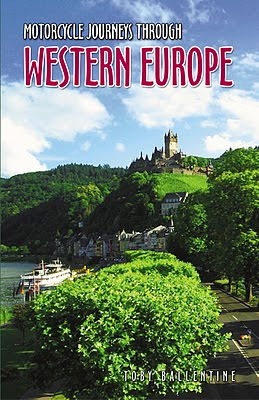 Some riders may have the false perception, which this book dispels, that travel in Europe would cost too much and take too much time to figure out exactly where to go. Veteran traveler and motoscribe Toby Ballentine shows in this new travel guide that Europe by motorcycle is both affordable and do-able, and provides riders with all the ingredients for a two-wheeled fantasy trip. Whether you prefer banking your way past an endless display of medieval castles, cheering for the running of the bulls in Spain, or retracing the steps of the historic World War II Band of Brothers, you can discover the Europe that has existed for centuries. Each of the sixteen core rides is organized around a different theme and illustrated with stunning full-color photographs, detailed relief maps, and full route descriptions. Practical information on where to rent motorcycles, proper driving etiquette, customs, money, camping, inexpensive accommodations, and the great places to sample regional cuisine are also included. The last chapter, “The Grand Tour,” suggests ways to link many of the core rides for travelers with more time to spend and a yen to explore at a relatively leisurely pace. 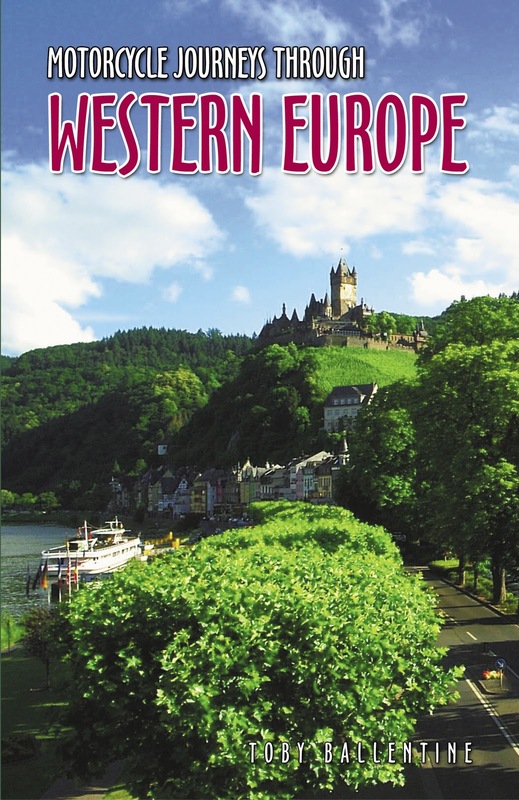 From the chateaus on the Loire River in France and the Renaissance hilltop towns of Tuscany, to the pilgrimage towns on the northern coast of Spain, or the enchanting Black Forest of Germany, Europe offers countless delights, many of which are detailed in Ballentine’s book. It is also the perfect companion guide to John Hermann’s popular Motorcycle Journeys Through the Alps and Beyond, now in its fourth edition. While Hermann focuses on the great motorcycling roads in the alpine area, Ballentine explores more broadly in Western Europe, placing as much emphasis on the history and culture of the different countries as on the ride itself. Each author offers his own unique routes, personal views, and individual perspective on how best to plan a custom trip to the places of most interest to you on a budget you can afford. Thought we'd try something a little new here. I like to read all the books that come our way but there's just some that slip through the cracks. They're still great books and very informative for their intended audience so we're going to start offering what we'll refer to as "Book Overviews." In a "Book Overview" we'll pull together comments supplied by the publisher and try to make a few quick comments where possible. Book Reviews are books we've read. As per usual, we'll still supply an Amazon link that you can use to get the best deal on a book AND support this website at the same time!